This morning’s post by fellow blogger, Joe Paduda, contained a small paragraph that linked to an article in the Harvard Business Review (HBR) about a hospital in the Cayman Islands that is delivering excellent care at a fraction of the cost. Joe’s blog generally focuses on health care and workers’ comp issues, and has never crossed over into my territory. Not that I mind that. In fact, this post is a shoutout to Joe for understanding what many in health care and workers’ comp have failed to realize — the US health care system, which includes workers’ comp medical care, has failed and failed miserably to keep costs down and to provide excellent care at lower cost. That the medical-industrial complex and their political lackeys refuse to see this is a crime against the rights of Americans to get the best care possible at the lowest cost. 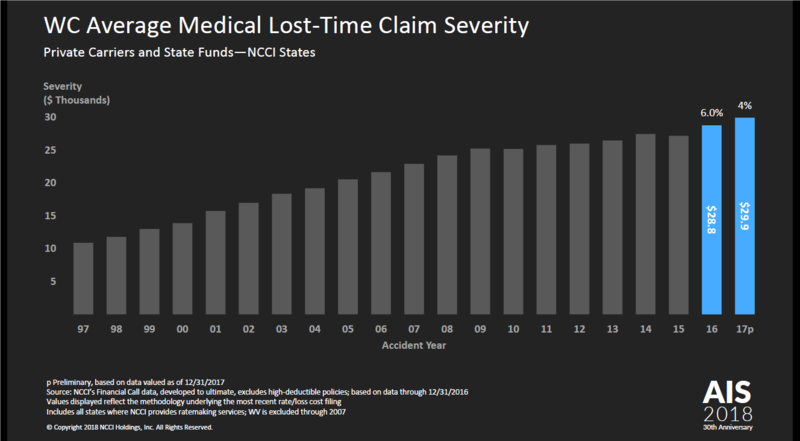 As I have pointed out in previous posts, the average medical cost for lost-time claims in workers’ comp has been rising for more than twenty years, even if from year to year there has been a modest decrease, the trend line has always been on the upward slope, as seen in this chart from this year’s NCCI State of the Line Report. The authors of the HBR article asked this question: What if you could provide excellent care at ultra-low prices at a location close to the US? Narayana Health (NH) did exactly that in 2014 when they opened a hospital in the Cayman Islands — Health City Cayman Islands (HCCI). It was close to the US, but outside its regulatory ambit. The founder of Narayana Health, Dr. Devi Shetty, wanted to disrupt the US health care system with this venture, and established a partnership with the largest American not-for-profit hospital network, Ascension. Narayana Health imported innovative practices they honed in India to offer first-rate care for 25-40% of US prices. Prices in India, the authors state, were 2-5% of US prices, but are still 60-75% cheaper than US prices, and at those prices can be extremely profitable as patient volume picked up. In 2017, HCCI had seen about 30,000 outpatients and over 3,500 inpatients. They performed almost 2,000 procedures, including 759 cath-lab procedures. HCCI is accredited by the JCI, Joint Commission International. A ringing endorsement from a practicing US physician about a medical travel facility and the level of care they provide. Hospital was built at a cost of $700,00 per bed, versus $2 million per bed in the US. Building has large windows to take advantage of natural light, cutting down on air-conditioning costs. Has open-bay intensive care unit to optimize physical space and required fewer nurses on duty. NH leverage relations with its suppliers in India to get similar discounts at HCCI. All FDA approved medicines were purchased at one-tenth the cost for the same medicines in the US. They bought equipment for one-third or half as much it would cost in the US. They outsourced back-office operations to low-cost but high skilled employees in India. High-performing physicians were transferred from India to HCCI. They were full-time employees on fixed salary with no perverse incentives to perform unnecessary tests or procedures. Physicians at HCCI received about 70% of US salary levels. HCCI saved on costs through intelligent make-versus-buy decisions. Ex., making their own medical oxygen rather than importing it from the US. HCCI saved 40% on energy by building its own 1.2 megawatt solar farm. The authors conclude by stating that US health care providers can afford to ignore experiments like HCCI at their own peril. Until this attitude changes, and Americans drop their jingoistic American Exceptionalism, they will continue to pay higher costs for less excellent care in US hospitals. More facilities like HCCI in places like Mexico, Costa Rica, the Caymans, and elsewhere in the region need to step up like HCCI and Narayana Health have. Then the medical-industrial complex will have to change. This entry was posted in Caribbean, Cayman Islands, Central America, Cross-border Health Care, Cultural Barriers, Disruption, Global Health Care Services, Globalization, Health Care, Health Care Costs, Health Insurance, Health Plans, Health Policy, Hospital Systems, Hospitals, India, insurers, MEDICAL COSTS, Medical Tourism, Medical Travel, medical-industrial complex, Outcomes, Patient Outcomes, pricing, value-based care, Workers' Comp, Workers' Compensation and tagged Caribbean, Cayman Islands, Costs, HCCI, Health Care, Health Care Costs, Health City Cayman Islands, Hospital Charges, Hospital Costs, Hospitals, India, Medical Costs, Medical Tourism, Medical Travel, Narayana health, Quality, Workers' Comp, Workers' Compensation on July 13, 2018 by Transforming Workers' Comp. Yesterday marked five and a half years since I began the blog. The areas in grey represent those countries that have not viewed my blog, and as you can see they are mostly in Africa and part of the Mideast, especially Iran (but you would expect that). Of course, there are exceptions, such as Greenland and those islands to the east of Greenland. Oh, and there is one other island that has not had any views: Cuba. And one nation that has been in the news of late: North Korea. Thank you all for the past five and a half years, and once again, I’d like to invite you to reach out to me whenever you want to discuss an article, or have something to add. I want to get to know my readers better. This entry was posted in Africa, Asia, Australia, Blogging, Brazil, Canada, Caribbean, Central America, Chile, China, Colombia, Continents, Costa Rica, Dominican Republic, Ecuador, Europe, European Union, Guatemala, Iraq, Israel, Latin America, Malaysia, Mexico, Middle East, North America, Oceania, Panama, Peru, Puerto Rico, Singapore, South America, South Korea, Spain and tagged Africa, Asia, Blogging, Central America, Continents, Europe, European Union, Latin America, North America, Oceania, South America on April 30, 2018 by Transforming Workers' Comp. U.S. Domestic Medical Travel.com published the following article this morning that discusses the impact of in-bound medical travel on an individual’s immigration status. This entry was posted in Anchor babies, Birth Tourism, Central America, Citizenship, Domestic Medical Travel, Health Care, Immigration, Immigration Fraud, Immigration Reform, Latin America, Legal Immigration, Medical Tourism, Medical Travel, Undocumented and tagged immigration, Immigration Fraud, Immigration Reform, in-bound medical travel, Latin America, Legal Immigration Work Status, Medical Tourism, Medical Travel, Undocumented on April 24, 2018 by Transforming Workers' Comp. I am writing you all to address some issues I am having with the industry on the occasion of my having past my five year anniversary writing this blog, and nearing another milestone, that of publishing 400 articles. At present, I am at 396. For the past few weeks, I have noticed on the social media site, LinkedIn that some of my connections in the industry have been attending conferences around the world, and more recently, I have replied that I wished I was there and posted a recent post with the message to advertise my willingness to collaborate, or attend such conferences. With the exception of one person this evening, not one person has responded positively, nor in the past five years has anyone other than one person invited me to speak at a conference, and that was three years ago in Mexico. The other two conferences I attended were here in Florida; one in Miami Beach, the other in Hollywood, Florida. The first in 2014, the second in 2012, and was the reason why I started writing my blog three days after it ended. My intention then, as now, was to transition into a new career path, so that I could be employed and enjoy the things other people enjoy, and see the world before I am unable to. But In the past five years, while I have connected with practically all the major players in the industry, defended the industry in numerous posts, and even been critical of the industry at times; no one, not here in the US, nor anyone in Latin America or the Caribbean has invited me to a conference or a fam tour, nor to any other part of the world that is not part of some current conflict. Recently, an American filmmaker had the premier of her film on medical travel on American television, on what we call the “Public Broadcasting System”. or PBS. I missed most of it, but was able to see two names in the credits that I recognized. One person I met in Miami Beach in 2014, the other I am connected with on LinkedIn, but have never met. I tried to contact the filmmaker, but when she did not respond, I contacted my connection, who told me she was leery about responding because I had had an association with an organization we all know, but do not like that purports to represent the industry. He had to tell her that I am legitimate. Folks, after five years of writing, and six, almost seven, of researching the industry, and being viewed on every major continent, you would think that many of you would know that I am honest, sincere, and definitely a legitimate advocate for medical travel. Last week, I discovered that there was a conference in Dusseldorf, Germany, and today, I learned that one of my other connections, who I did meet in Reynosa in 2014. was invited to a conference in China. What does it take to be taken seriously and given the respect and courtesy of being invited to attend these functions after all this time? I don’t want to sound like I am complaining, but I feel that after all this time, it is wrong for me to be ignored. I have committed long hours of my time and my life to this industry, even as my health over the summer was an issue. I am not out of the woods yet, but I am doing ok, and with the proper treatment, and eventual surgery, I should be healthy in the future, and can travel until such time, as long as I have more than two weeks notice. In the beginning of my blog writing, I added a section where I asked readers to tell me where they are from and who they were. No one responded, so I stopped the practice. I still would like to hear from you, but after reading this letter, I hope you will do more than just dropping me a note. I am waiting to meet you and to participate in future conferences. Map shows countries to date where my blog has been viewed. This entry was posted in Africa, Asia, Australia, Blogging, Central America, Conferences, Continents, Domestic Medical Travel, Europe, Health Care, Medical Tourism, Medical Travel, Mexico, Oceania, South America and tagged Blogging, conferences, invitations, Medical Tourism, Medical Travel, White Paper on December 14, 2017 by Transforming Workers' Comp.